Playa Blanca is the newest of Lanzarote's three main resorts and is located around a forty minute drive from the airport at Arrecife. Thanks to its location on the southern tip of Lanzarote Playa Blanca tends to enjoy the best weather - and this microclimate makes it the best choice for a sunshine break during the winter months. The resort is also home to a large selection of top quality Lanzarote holiday villas and apartments. Providing all of the perfect ingredients for a self catering holiday. Playa Blanca is essentially comprised of three large coves all of which are located in one much broader bay right at the southern tip of Lanzarote, just across the Bocaina Straits from the neighbouring island of Fuerteventura. Both the climate and beaches here made Playa Blanca an obvious spot for development and the resort started to really expand during the 1990's, usurping Costa Teguise as Lanzarote's second most popular tourist destination. 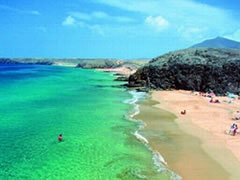 Today the resort extends from the Faro de Pechiguera in the east through to the outer fringes of Papagayo in the west. With the bulk of tourist activity centered around the three main beaches of Playa Flamingo, Playa Blanca and Playa Dorada. 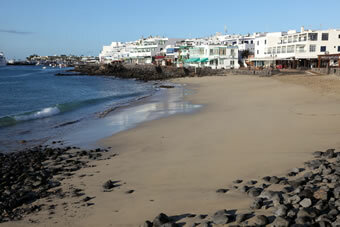 Read more in our guide to Lanzarote's beaches. As well as these three excellent resort based beaches Playa Blanca also boasts the beautiful coves and bays of Papagayo right on its doorstep. These perfect playas are officially designated as a protected zone and remain in their natural and undeveloped state. So there are no hotels or apartment complexes spoiling the views here. They can be reached on foot, by car or even by water taxi from the ferry harbour located in the centre of Playa Blanca at the end of Calle Limones. Which is also the main shopping thoroughfare and home to the largest supermarkets in the resort - a point worth noting if you are planning to book one of our villas in Playa Blanca. The Rubicon Marina first opened in 2004 and has since become a popular berth for luxury yachts and craft from around the world, providing Lanzarote with a second excellent sports marina (with Puerto Calero being the other). The Marina is home to a good selection of bars, restaurants and shops so it's a great place to browse away an hour or two. And it also plays host to a regular market every Wednesday and Saturday morning. 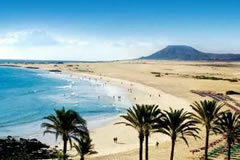 Why not take the opportunity to visit the neighbouring island of Fuerteventura? The island is quite a contrast to Lanzarote and the amazing Dunas National Park, which boasts one of the biggest beaches in the world, is just a short distance from the ferry port at Corralejo. The crossing takes about 30 minutes (depending on who you travel with) and services are available hourly throughout the day. As you would expect there's no shortage of restaurants to choose from in Playa Blanca. Many, especially along the seafront, tend to serve traditional Canarian food. So expect a heavy focus on fresh fish, often served quite simply with salad and papas arrugadas, small wrinkly spuds cooked in salt water. There are however numerous establishments that offer more varied and modern international cuisine, such as La Bocaina which is located on the way into the resort. And the ever popular Almacen de Sal, located in an old salt depository right on the seafront by the small beach, Playa Blanca, from which the resort takes it's name. Playa Blanca is also located just a short drive from some of Lanzarote's most important and popular visitor attractions. The most prominent of these is the Timanfaya National Park, created by eruptions during the 1730's and 1820's, where tourists can explore the most amazing lunar landscapes on guided coach tours. Other volcanic wonders such as the Green Lagoon at El Golfo and Los Hervidores (The Boiling Pots) are also nearby.